There were fifty-four seconds left to go in the Patriots-Chiefs January 20 playoff game. Pete had gone up to bed and for some reason, I was still watching. I am not a Patriots fan, but I had shouted up to him to get down to see this exciting finish. I glanced at the kitchen door where Ochi, our Great Pyrenees, had her nose pressed to the glass wanting to be let inside. Except….Ochi, 12 years of age and happy to lie by the wood stove, was at my feet. The waggling, enthusiastic body at the door belonged to another Great Pyrenees. Ida Louise, our livestock guardian. Most recently, however, she has been known to take periodic roaming vacations from her job as farm watch dog. Needless to say, Pete came down, not to watch the game, but rather, to hook Ida to the leash and return her to her sheep and goat companions. She looked a little down at the mouth. She is still a “pup” in her interpretation of that word, just one year old, and that should allow for disobeying rules sometimes. Still, she knows her job. She must constantly pay attention to her surroundings. She must be ready to bark the instant something disturbs her. At night, if I switch on the outside light and call one of the cats, she barks. At daybreak the crows fly overhead, and she is alert to their direction and location and follows them across the 13 acre field. The great horned owls who are regular residents here know she protects the broilers from their talons all summer. I am sure the coyotes and foxes are aware of her presence. Ida in her favorite form of repose. Ida is not locked in a small pen. She is in the paddocks where she can move from the sheep to the goat areas. Some days she is out with the 21 cows. Sometimes, she is going on a walk with Abby to North Ridge, Abby and Jake’s nearby farm where the layer hens live. Or she walks with Pete to make a loop around the 13 acre field. But, her job, and we point that out to her daily, is to be on guard. That means, she can’t come in the house like Ochi. With this snowy winter, however, there are mounds of plowed snow which make it a cinch for a powerful dog to summit, thus scaling the fences, bound for the other side and freedom. So, back to the paddock Ida went that wintry January evening and settled down to watch the night sky. By the way, Pete did get to see the end of the Patriots’ game. He hoofed it back to the living room before the whistle blew and settled down to watch football. Dogs are an iconic part of American farms. Border collies may be the first breed you picture and while these hard-working athletes are common, they aren’t the only useful ones. As a dog lover, I especially enjoy looking through Jan Dohner’s recent book, Farm Dogs. The sheer variety of dogs and their historic uses is inspiring. At Apple Creek we’re keen to keep two specific types of working dogs; terriers and livestock guardians. Fiercely loyal, tenacious and energetic the terrier is well-suited to farm life. These dogs are useful in keeping squirrels out of the barn, catching nesting mice in the hay mow and digging up burrows of ground hogs. Ever watchful, it is difficult to get anything past these dogs! Terriers come in a wide variety of sizes based on their use. The largest I’ve met is the Black Russian Terrier . These dogs weigh as much as 140 lbs! Our first terrier was Chicory (pictured at left). Also called the Blonde Coyote, he lived to the ripe old age of 13. His years were spent on various farms across New England where he learned about farm life alongside Abby. Chicory weighed 35 lbs, large enough and tough enough to intimidate the livestock, but small enough to join us on the couch. We miss Chicory the most at lambing season. He wasn’t always at ease with people, but was an amazingly attentive nursemaid to our lambs. He loved to lick the lambs clean after they drank their bottles or to encourage them to drink up by licking their behinds. Many readers know our newest terrier, Rye. He came to us in the summer of 2016 as a rescue from Arkansas. He is a mix breed and though his coat says “terrier” his behavior indicates he may have an equal mix of retriever. Ever playful, Rye loves a good ball toss and was described by our nephew as a, “real boy’s dog.” Rye only weighs 20 lbs and so he isn’t much for interacting with the livestock. He prefers cruising the fields looking for mice and voles. Like all terriers, Rye has a surprising bark which he loves to use. Often, he uses it to bring our attention to a piece of equipment that has changed location in the dooryard or to scare off potential threats. Both Rye & Chicory have proved they are more brave than brainy. Rye has met several possums in his time here in Maine and he has to be convinced not to tangle with them! Ochi is a Pyrennees / Maremma cross. She joined Janet and Pete’s household about 10 years ago and has slowed down the last few years. Ochi walks the perimeter of the farm every morning with Pete. This keeps large carnivores like coyotes out which keeps our animals safe. There are a wide variety of livestock guardian dogs from locations worldwide. Several studies are underway to use dogs to guard large sheep flocks in the American West. Though the farm hasn’t had a coyote attack in more than 10 years, we’re sure that having Ochi around has helped. That’s why we’re adding a new member to our farm dog crew this season. We’ll be picking up a Great Pyrennes pup very soon! She’s been raised alongside goats at a farmstead in Massachusetts and we look forward to introducing her to the farm. 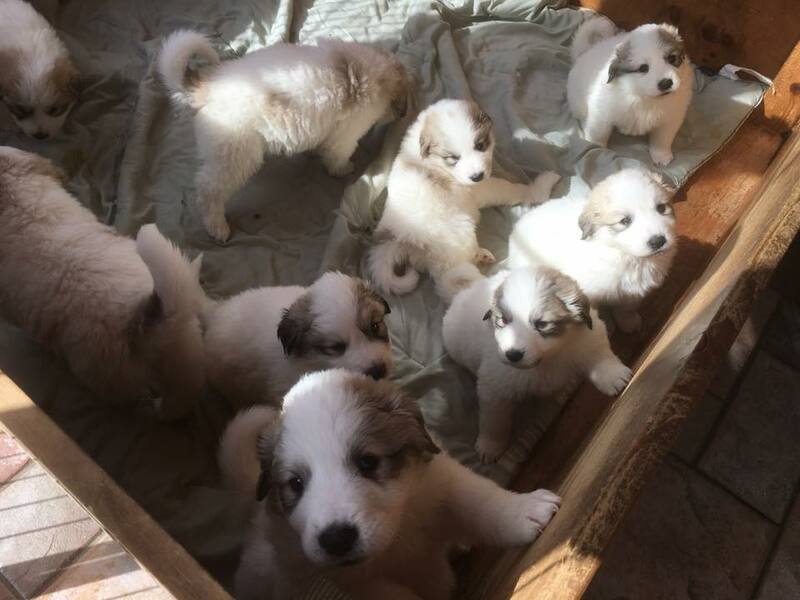 This photo of the whole litter (below) may give you the same sense of excitement we have. We visited the breeder last week to identify a couple of prospective pups. The breeder will be watching each as they get introduced to their goats to find us just the right temperament– a independent and confident pup that will be up for the job. Our new girl will have her work cut out for her. In a recent blog post, Who Else Lives on the Farm we describe some of the recent uninvited guests who have been calling on our hens! Our new pup will be trained as an LGD or Livestock Guardian Dog in order to spend her days (and nights) patrolling the fields and deterring owls, hawks and other would-be predators. This will help us sleep better and eliminate the need to lock up our broilers and turkeys every night. 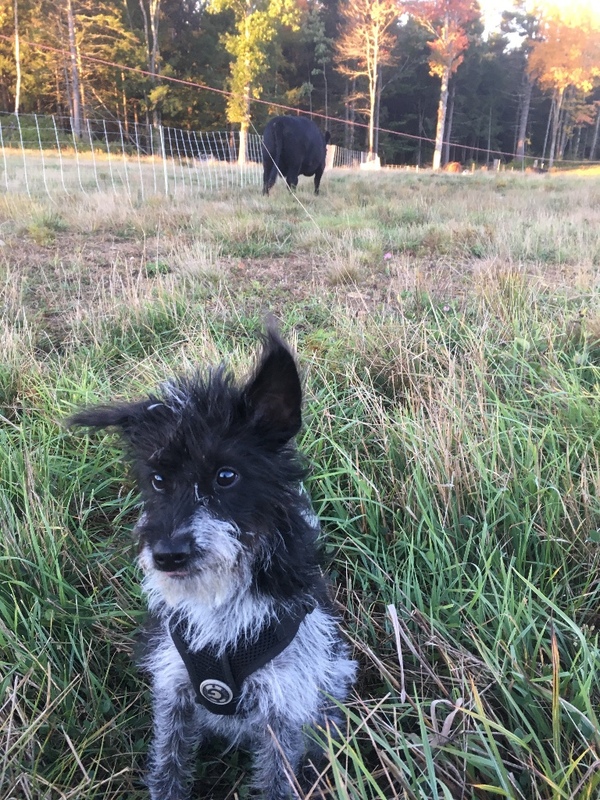 We’ve been reading our copy of Jan Dohner’s other book, Livestock Guardians to be sure we’re prepared and know how best to support our new pup as she learns basic obedience and how to trust her instincts. Breeds such as the Great Pyrenees don’t need to be “trained” how to protect their stock. For centuries they’ve been bred specifically for that purpose, so our instruction will mainly be corrected undesired behaviors such as chasing livestock. Stay tuned for more on this topic! We’re just about done with lambing with a single ewe left. 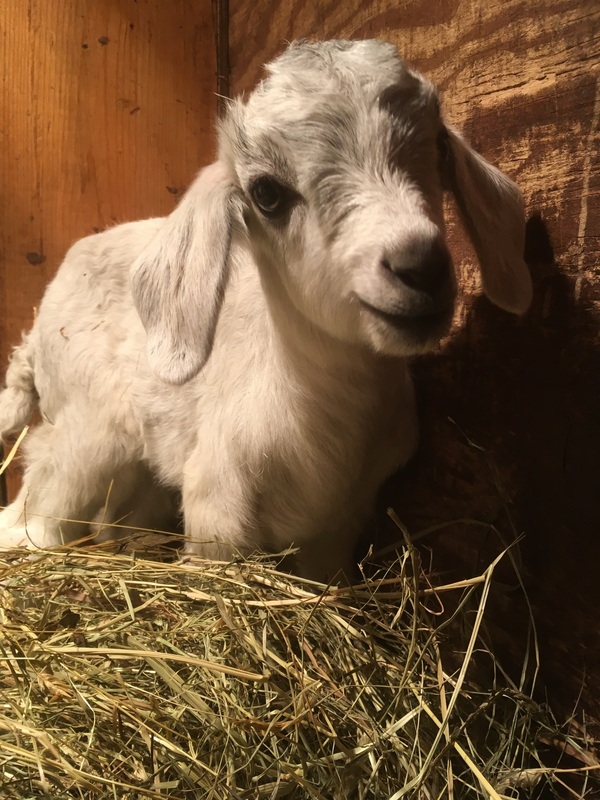 The goat kids have begun to arrive and we have 10 kids out of 5 does so far! The lambs are bashful and shy when they are born, while the goat kids come into the world willful and independent. We give all our newborns a shot of BoSe, a selenium and vitamin E booster commonly given to goats residing in selenium deficient areas. Selenium is necessary to maintain muscle tone in adults, and prevent “white muscle disease” in newborn animals, read more. These shots are given under the skin and take less than a minute. However, in that time the average goat kid will emit 2-5 blood-curdling shrieks. Keep in mind these babies are roughly 4-6 pounds, half the size of lambs, which can weight between 10-15lbs. Size can be deceiving when it comes to these little ones! Our first batch of broilers arrived on Thursday which to me is the OFFICIAL start of the season. 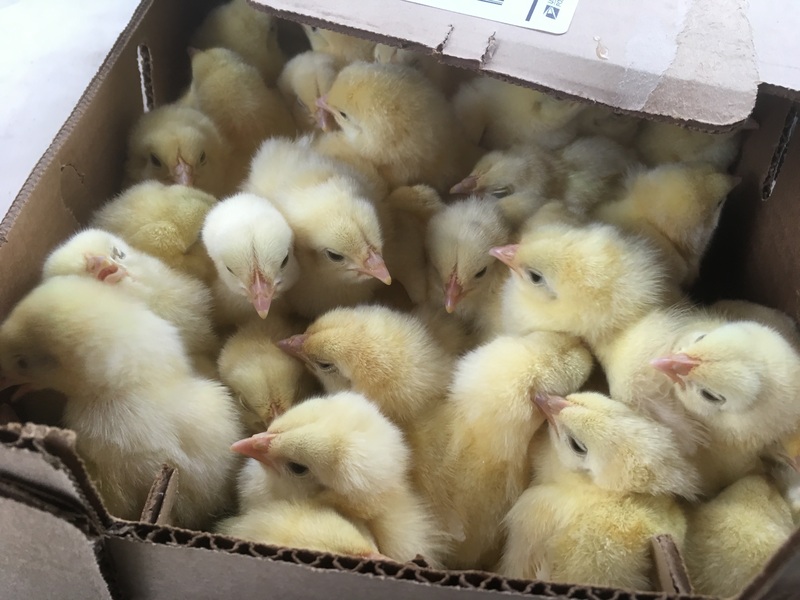 We plan to start having chicken at market by the end of May with weekly processing through the summer. Part of our expansion plan includes having a walk-in so we are aiming for fresh chicken at both Tuesday and Friday markets. Stay tuned for a post on our processing schedule or follow the farm’s Facebook page where we’ll announce where you can find fresh chicken. 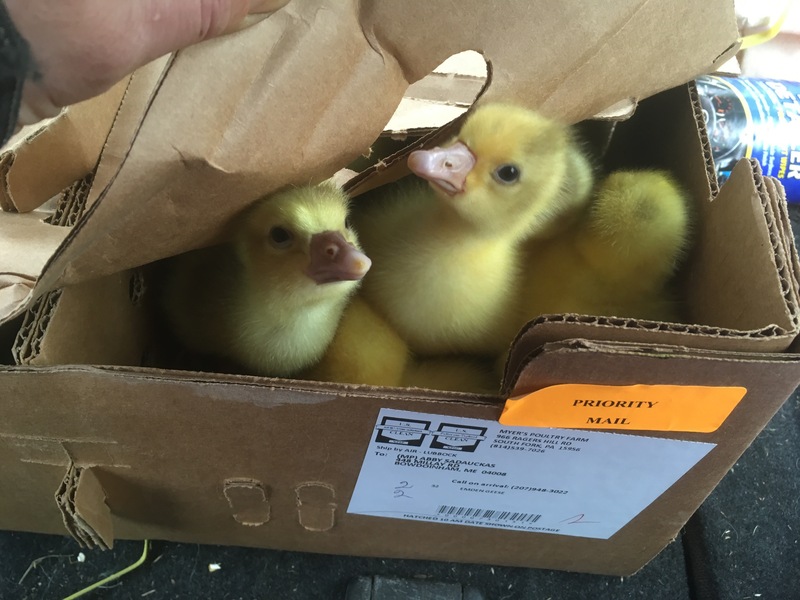 Our first batch of goslings also arrived! They are the sweetest of creatures. These are the only babies who are visibly excited to see US! These Emden goslings will be raised alongside our broilers this year to protect them from the avian predation we’ve experienced the last few years. A fellow farmer shared with us the tip to start them off together so that the geese learn to appreciate the chicks from an early age, otherwise some bullying occurs. We will be offering holiday geese again this year. Like turkeys we will start the reservation list in July and you’ll be able to choose when you’d like your goose in either November, December or January. We have 10 DAYS left on our crowdfunding campaign. Our thanks for the donations we’ve received so far. We love growing happy, healthy animals and appreciate your recognition of our work. Your continued support means a great deal to us. The funds we raise will be used to purchase a hoop house, nest boxes and related lumber and supplies for a larger and improved winter house for our hens. A year from now we aim to have 500 hens laying which will mean more of our great eggs and expanded availability at Morning Glory in Brunswick and as an “add-on” share to a local vegetable CSA. There are many benefits to be derived from this expansion. We’ll be using 4 moveable houses to rotate our hens through pasture which will add a tremendous amount of fertility to our soil. We’ll need it as we open up our new land and to ensure the continued productivity of our current acreage. Please support our campaign and share it with your networks of friends, family and neighbors who are excited about new farmers and local, organic food. No pledge is too small and we’re glad to accept pledges at farmers market and answer your questions about the project. We created a detailed post about the farm’s expansion plans and in coming weeks we’ll share how the changes we’re planning will improve animal health, streamline management and allow us to grow the farm while maintaining the same high quality of products & our sanity! We know that crowdfunding isn’t for everyone and we’ll be launching a Market Share CSA later this month. This will allow you to purchase a flexible sized “share” and give you a cash bonus based on the size you choose. Much like a CSA this will help us have operating funds during May and you’ll have the flexibility to use your share to purchase whatever you like throughout the 2017 season. Look for details at market and in the next newsletter where we’ll also talk about outdoor markets- just 4 weeks away! Update! We reached our funding goal! Thank you so much to those that contributed, shared our campaign and let us know of their support for our farm’s growth. We are so appreciative. Though our hens produce more than 100 dozen eggs each week we are often sold out within the first 2 hours of our farmers’ markets. Our eggs, produced by free-roaming and adventurous hens are in high demand because of their golden yolks and unparalleled freshness. We love our animals and want to provide them with the best possible living conditions. Through this project and others detailed in our “growing out” plan we can both improve animal well-being and create efficiencies. These changes will enable us to grow our business to provide more local, organic meats & eggs to the great Brunswick area and support us as full-time farmers. Last week we launched a crowdfunding campaign to raise $12,000. The funds are specifically to build housing to double the number of hens we keep from 250 to 500. We also see this as an opportunity to raise awareness about the farm, our products and kickstart the farm’s expansion. At present we lease the majority of our farm buildings. Over the last 3 years our business has grown, fueled by local demand, and we’ve outgrown our leased barns. We’re ready to begin expanding the farm to land we own in order to build the larger barns, processing areas and the cold storage we need to farm long into the future. We have great markets, unparalleled products and a love for our work- with your support we can make this vision a reality. Please pledge & share our campaign. The fall has been downright gorgeous with so many colorful trees around the farm! It has been a glorious backdrop for all our late summer and fall activities. We’ve been raking up huge bags of leaves to feed the goats through the winter. They delight in the crunch so much we call them goat “chips.” We’ve also been putting ewes into breeding groups and have incorporated a new, Clun Forest Ram. If you recall Sam our bull then you’ll want to check out the photos on the farm’s Facebook page to see his calves. We have had two so far and are waiting on three more. 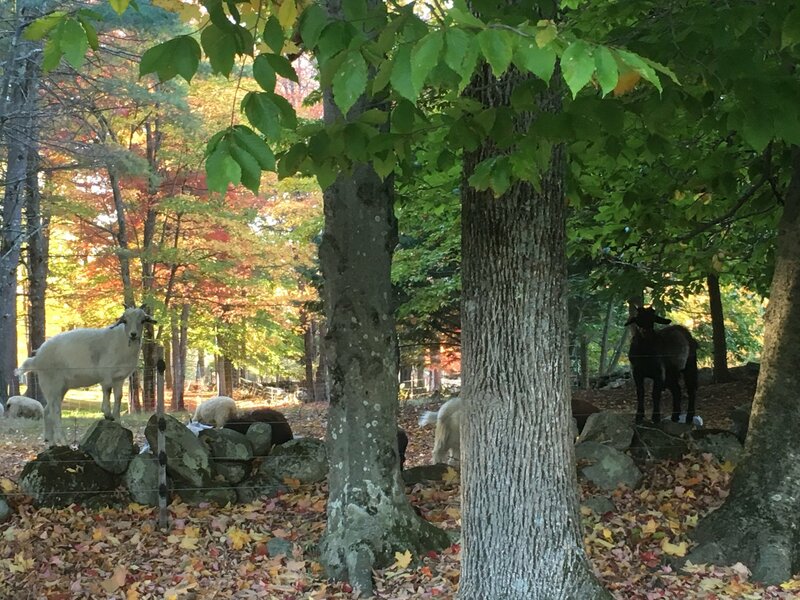 Our goats spent the end of summer grazing at Six River Farm, helping to clean up some woods edges and cover crops. We are so glad for the collaboration with other farms particularly when grass was in short supply. Because of this, it was fortunate that we are not raising geese this year. We will resume raising them in 2017. If you had been planning on a goose for your holiday table let us know, we can help you choose another one of our delicious options. If you haven’t seen us at market recently then you’ve missed meeting our new canine ambassador, Rye. He is a rescue pup from Arkansas who has filled the giant holes in our lives and hearts left by our previous dog, Chicory. 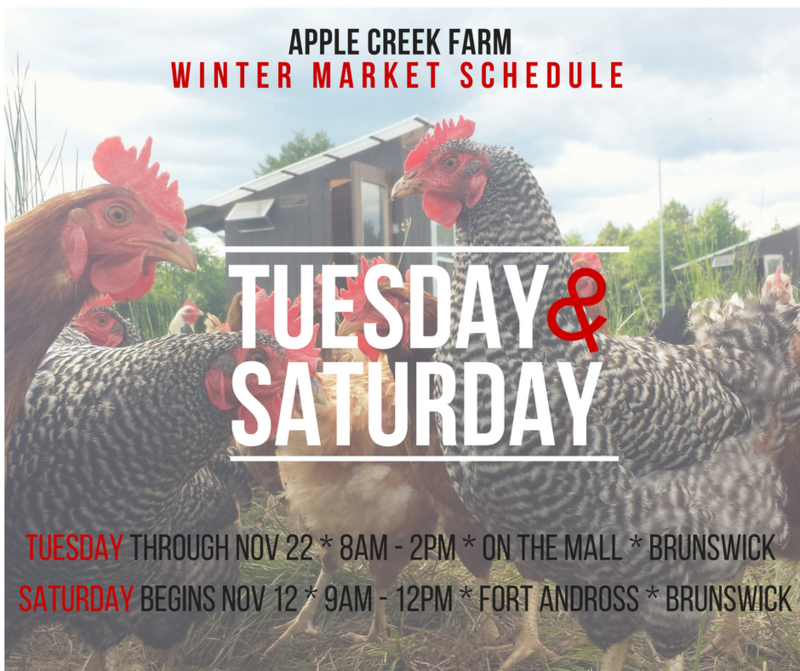 Since Rye won’t be able to attend Brunswick Winter Market inside Fort Andross be sure to stop by on Tuesdays at Brunswick Farmers Market or on Saturdays at Brunswick Topsham Land Trust’s Market at Crystal Spring Farm. We are still taking orders for Thanksgiving turkeys and our market schedule is below. UPDATE: We are SOLD OUT for 2016. Please see us at farmers market to add your name to our waiting list. We thank you for your support of organic farming! 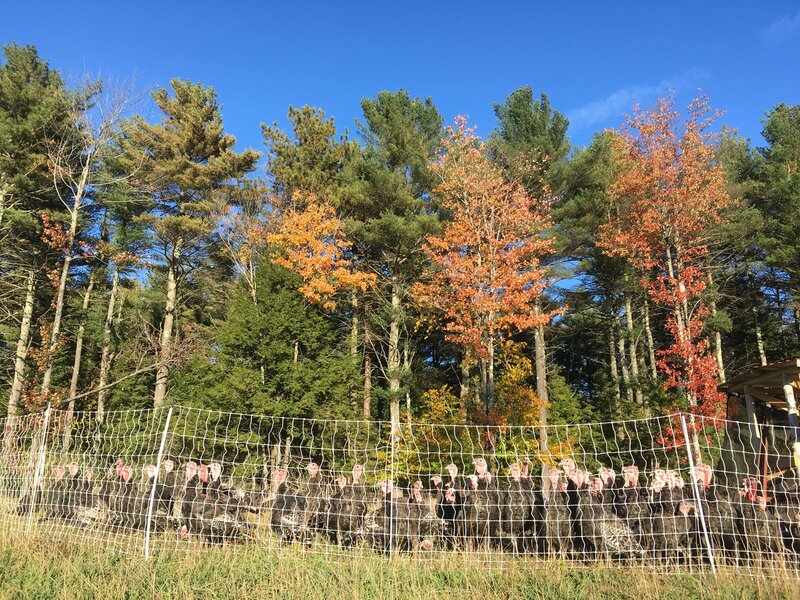 Our gorgeous organic turkeys are out on pasture surrounded by the colors of autumn. We are rotating these birds through a section of field we reserved just for them! This took some planning as the dry summer left us with less pasture for all the animals. To be sure you’ll have an Apple Creek turkey for your Thanksgiving feast follow this link to reserve yours. Our birds are also available in the Portland area through Rosemont Market and in the greater Dover-Foxcroft area through Spruce Mill Kitchen. We’re adding new products to our current line-up of certified organic meats! These include ground turkey, drumsticks, wings and backs. This will lengthen our turkey season which had been limited to whole birds for Thanksgiving. One of our goals is to be able to offer all of our products year round. So, getting turkeys in the early spring to be finished in late summer is one way to do that. Our turkey poults arrived in the same way as most of our poultry, as day old birds shipped via the US Postal Service. We had ordered all toms (males) in order to maximize their ability to grow out relatively quickly. Keeping the poults warm during a Maine spring is no easy feat! We used between 2-4 heat lamps at any given point during the day to ensure even heat of nearly 90 degrees. After 4 weeks, once the poults are fully feathered we allowed them outdoor access using small wooden fences. Each fence is constructed of strapping covered with chicken wire. An eye screw at each end allows us to use fiberglass poles to stake each panel. We build the panels at 4′ for the turkeys and then cover the outdoor area with shade cloth in order to protect them from predators and to keep them from flying out. The sound of a loose poult is very distinctive! After a week or so of the panels and tarp we began using Premier poultry netting to keep them contained. These fences are key to our operation and once electrified keep the turkeys in and other critters out! Our birds grew a bit more slowly than in the past due to the lack of rain. The drought meant that new pastures weren’t as lush and rich so more frequent moves were needed. For me the weather in July seemed more like August, so it feels a bit like we’re getting an extra month of summer! We’ll be busy this month with our last two groups of broilers, introducing the turkeys to pasture and hopefully enjoying a day or two at the beach with visiting family members. We had a fun Open Farm Day and thank everyone that came out despite the rain. The day cleared shortly afternoon and we were able to enjoy the local foods bbq with family, friends and neighbors. We are hoping another such rainy morning will come along soon as our pastures are getting quite dry. If you have been to the farm you know we have many beautiful trees and this year there are distinct patches of dry grass around them. If you’re curious about where we stand with rain visit the US Drought Monitor. We are fortunate to have options to mitigate the dry conditions though this does mean feeding hay earlier and grazing what has in the past been an on-farm hay field. Due to a variety of circumstances we won’t be raising geese. While this a big disappointment (they are the most adorable babies) it also a blessing as the dry weather means there is less grass coming up. The geese are fantastic grazers and grow best with plenty of pasture. We will be raising turkeys for Thanksgiving again this year. These birds are available to order now, so be sure to make a note. Birds are priced at $5/lb with average sizes between 12-15 lbs. We sold out last year so don’t delay! So what else has been happening on the farm? Summer is here in all its glory! We’ve been spending our days moving fences, watering animals and making hay. Our hay making game has improved this year with the purchase of a (new-to-us) round baler. Round bales which are roughly equivalent to 15-20 square bales have allowed us to take advantage of all the sun and get all but one of the 30+ acres of hay fields done! Now, we wait for rain! 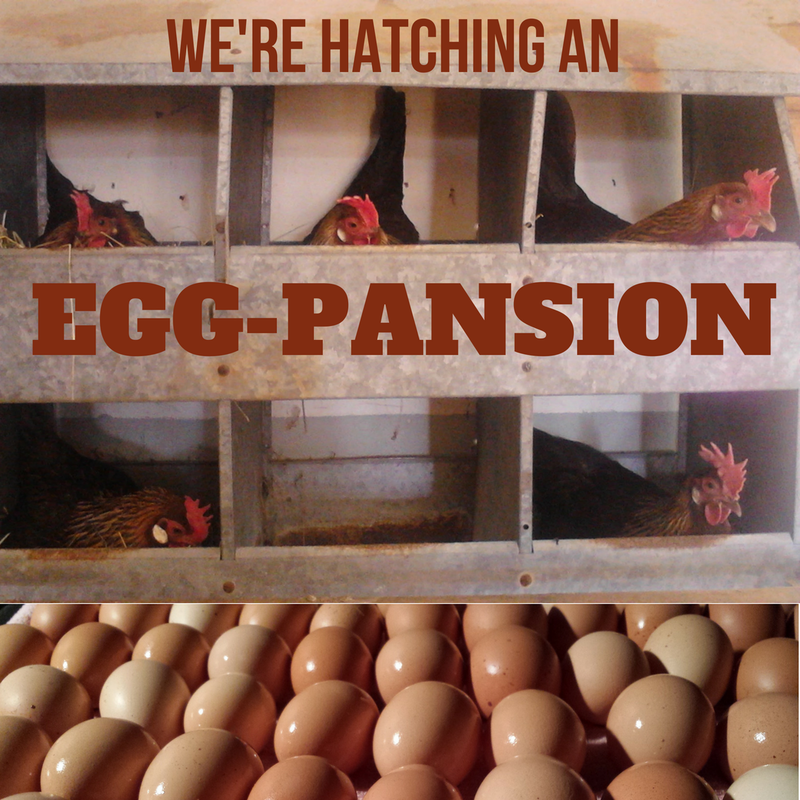 Our new flock of hens has begun laying full-time and full-size! 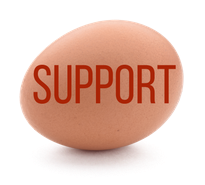 We are glad to have plenty of eggs at markets each week. No more awkward moments when there is one dozen left on the table! If you miss us at market you can also find our eggs at Morning Glory Natural Foods in Brunswick. We hope you will all join us for Bowdoinham’s Open Farm Day on Sunday, July 17th. We will be open from 9:30 AM to 12 NOON. We will have a farm stand set-up and offer tours of the farm. A local foods BBQ will be served in the afternoon, so do be sure to visit the event website for all the details. Thank you for all the support at markets, shopping with your local farm does make a difference! We are glad for your encouragement as we grow the farm. We’re thrilled to be headed outside for another market season! You can find us twice weekly at markets in Brunswick. 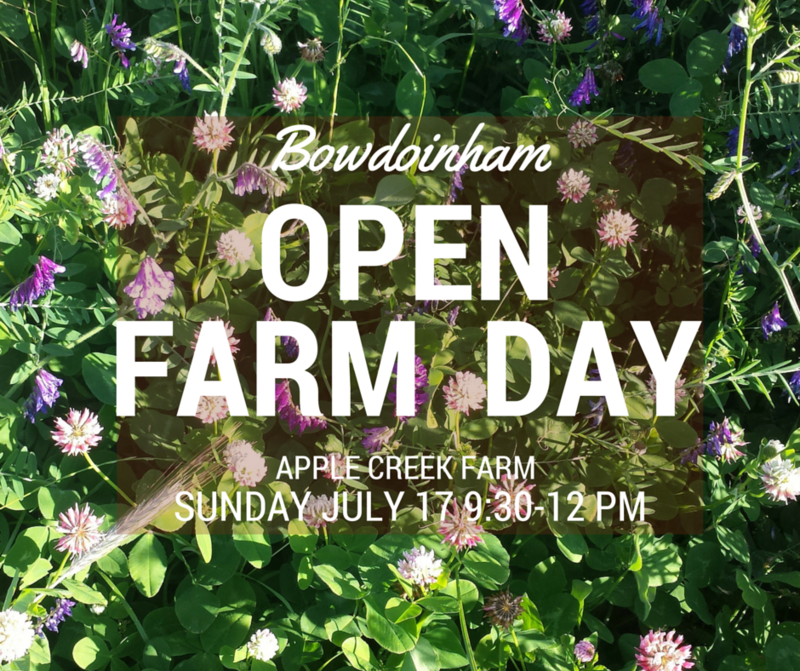 Mark your calendars now for Bowdoinham Open Farm Day held on Sunday, July 17th. Apple Creek will be open from 9 am – 12 noon and an afternoon local foods barbecue will be held at the Mailly Waterfront Park. What will we have? Check out our “What’s in Season” post here. Starting in June we will have fresh chicken (cuts as well as whole & half birds). Due to our processing schedule they will only be available on Saturdays at the Brunswick Topsham Land Trust Farmers Market. In July we’ll start taking orders for our Holiday birds. We sold out of both goose and turkey last year so don’t delay! New Products! We’ll be raising summer turkeys this year in order to offer both ground turkey and drumsticks during the fall and winter. Like all our poultry these birds are raised outside on a diet of fresh pasture and certified organic grains. We take the utmost care in raising our birds to provide you with the healthiest food for your table.